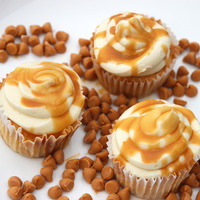 A sweet fluffy vanilla cupcake with a thick butterscotch cream cheese icing then drizzled in butterscotch. It really is more like the topper of the cupcake than the whole thing. This is a sweet and slightly dense mix. The cupcake itself is light and subtle and this mix is really more about the frosting, that oh so yummy butterscotch frosting. It's as if you took the top of the cupcake off and ate only that. It is decent as a shake n vape but for best results, give it a week for the frosting to really develop in the mix. I love Butterscotch Ripple. It is an excellent butterscotch that pairs very well with CCI and the 2 together make an excellent frosting. I couldn't detect any off notes from either of these flavors. Doesn't hurt that CCI is one of my all time favorite flavors. Its creamy and has that very realistic zing you get in actual cream cheese frosting. I could really see using these together again in an ice cream vape down the line. This acts as the cupcake portion. Its actually not as strong in the mix as I was wanting but its great where it is right now. Its not an overpowering bakery flavor but more of a sweet vanilla cupcake base. This recipe is the property of ExclusiveGirl and released under the CC Attribution-NonCommercial-NoDerivatives 4.0 license. You may not copy, derive or commercialize this recipe without following the terms of this license or the explicit permission of the creator. June 10, 2017 : Don't have Cream Cheese Icing so I used Cheesecake with Graham Cracker Crust at 2.5% and Vanilla Whipped Cream 2%k Delicious....Flavor is light and I gave it a hot bath to quick steep for a Shake and Vape.....going to steep though and try again. Flavor is really Excellent, going to order the correct ingredients to try it with everything exact. Very nice. I also needed a bit more butterscotch for my taste, but the cupcake and cci are beautiful together. Thanks ,I can see this staying in my rotation for a while. Very nice simple recipe especially since all four flavors are probably all my favorites. I added 1% FW butterscotch(natural) and it's a perfect balance for the butterscotch for me. I wished there was just a wee bit more butterscotch here, but that might have been from trying it at max VG instead of my usual 70/30, and otherwise this tastes delectable. There's nothing off or unpleasant about it in any way whatsoever. I enjoying the vanilla bakery base right were it is, just as it was described, like a muffin top but for a cupcake, a cupcake top which is covered with sweet butterscotch/cream cheese icing. Those should be a thing. Who cares about the bottom half of a cupcake, anyway?